The Maple Leafs, Their Love of the Stretch Pass, Inability to Execute it and Why it's Still the Right Approach. - The Point Data-driven hockey storytelling that gets right to the point. The Maple Leafs, Their Love of the Stretch Pass, Inability to Execute it and Why it’s Still the Right Approach. You’ve got questions about the Maple Leafs defense. We’ve got answers. 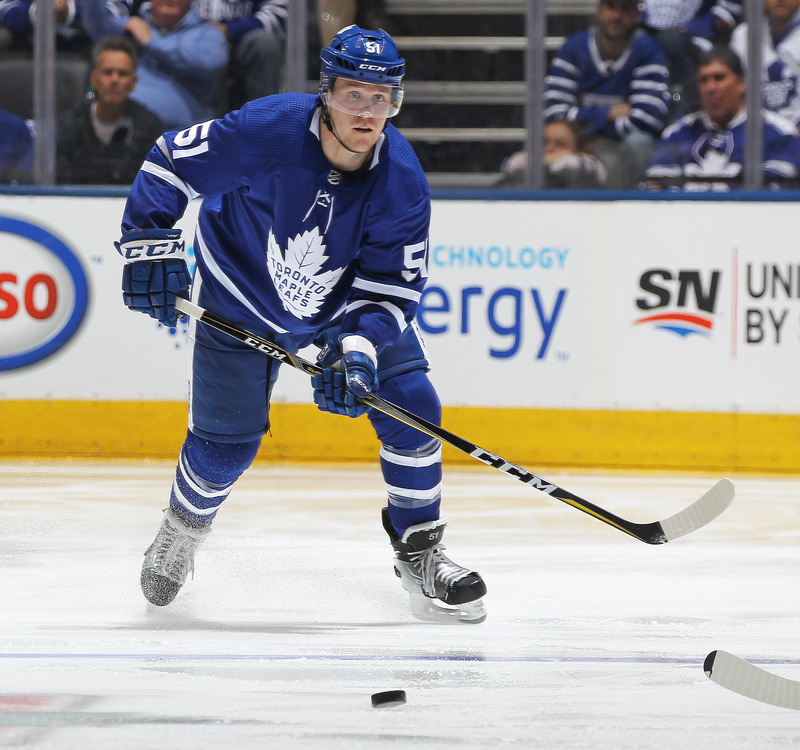 Touted as a Stanley Cup contender’s Achilles’ heel, the Leafs blueline is far from great and when it comes to moving the puck out of their zone, they’re flat out bad. But if this is keeping you up at night, you can stop worrying. We’ll explain why in this article. At even-strength, Maple Leafs defensemen iced the puck 283 times last season. Only Arizona was worse. The Leafs dumped the puck out on 27% of their exits – 23rd in the league and ranked 16th in skating the puck out. Not ideal. They also attempted more stretch passes than any other defensive corps in the league and had the worst completion rate in the process. When you look at where Leafs defensemen, with a minimum of 100 stretch pass attempts, ranked across the league in completion rate, you’ll find most of them at the bottom of the list. Gardiner went to the well a few too many times in that fateful game, attempting 12 stretch passes, the second highest single-game total for any player in any game last season. That’s a whopping 1,355 regular season and playoff games. Gardiner completed only 5 and a couple of his misses cost his team. Also, Travis Dermott ranked among the NHL’s top 25 in stretch pass completion percentage – more on that shortly. Even though the Leafs are clearly not great at making these passes, their volume approach is the right one for two simple reasons. The majority of goals scored off zone entries occur within seconds of entering the zone. The reward of a completed stretch pass vastly outweighs the risk of an incompletion. Three quarters of goals scored at even-strength, off a zone entry, controlled or uncontrolled, happen within ten seconds of gaining the zone. The quicker you get the puck up ice and attack with speed, the better. The Maple Leafs do this well. Last season, Toronto ranked 2nd in even-strength goals, 10th in odd-man rushes and 6th in scoring chances off the rush. They ranked 21st in offensive zone puck possession time (371:23). This is a team that strikes fast and hitting speedy forwards with passes in the neutral zone plays a big part in their success. As for the risk / reward of stretch pass attempts, here’s why a volume approach works: Looking at what happens within ten seconds of both successful and unsuccessful stretch passes tells us whether it’s worth going for a homerun pass out of the defensive zone. Last season, the Maple Leafs generated 162 scoring chances within ten seconds of a completed stretch pass. Only 19 scoring chances came back the other way off an incomplete attempt. So, for every 9 scoring chances they got from a completion, they allowed 1 from an incompletion. Looking at goals, again the risk was worth the reward at a 14:1 ratio. The league-wide average was 9:1. Here’s my theory as to why the reward vastly outweighs the risk. A completed stretch pass can lead to a controlled zone entry, odd-man rush or breakaway – all increasing a team’s chances of producing a scoring chance and ultimately a goal. Remember, 75% of goals scored off entries last season came within ten seconds. The faster you get the puck up ice and the quicker you create offence once in the attacking end, the greater your odds of scoring. As for incompletions, more often than not an incomplete stretch pass will lead to a neutral zone puck battle that can be won by either team. Rarely are these passes picked off clean and taken back the other way for a quality chance and if they are, there’s always at least one defender back – you guessed it, the guy who made the pass. 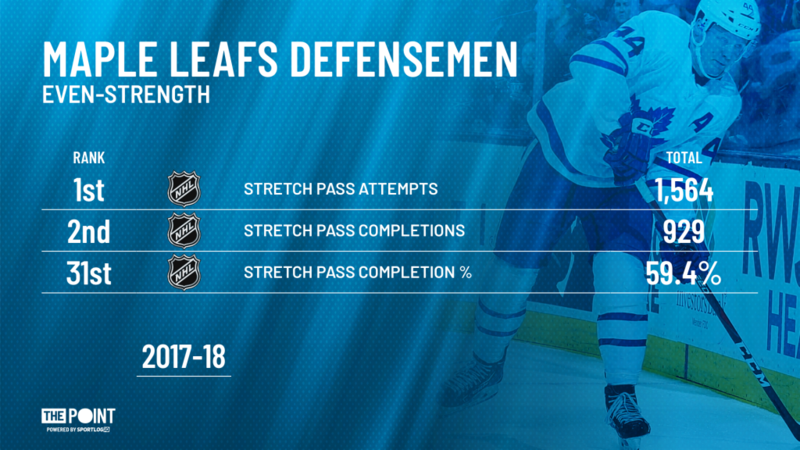 In fact, the Maple Leafs defense attempted over 1,500 stretch passes last season and only saw an incompletion come back to bite them one time. Once, an incomplete stretch pass came back the other way and resulted in a goal within 10 seconds. It happened while the Leafs were protecting a 1-goal lead against the Columbus Blue Jackets with less than 3 minutes to play. The Blue Jackets went on to win the game in overtime. On the surface, it seems like Morgan Rielly made a terrible play however Patrick Marleau got caught flatfooted which allowed Seth Jones to beat him to the puck. With a line change in progress, there was no support and Marleau didn’t adjust. Ironically, Reilly was likely trying to make the safe play – get it up for a chip and change. Unfortunately, this didn’t work and it cost the Leafs a point. That one’s on the forward. The point is, plays like this and the Gardiner play that led to the Bruins 6-4 goal in Game 7 get magnified. Complete ten stretch passes that lead to goals, screw one up that ends up in your net and guess what people remember? All that said, of course the Maple Leafs will be better served by completing more of these passes given how often they attempt them and that’s where we circle back to Travis Dermott. As discussed earlier, Dermott success rate with these passes was the best among Leafs defensemen and he was the only one to hit above 70%. Dermott has shown, albeit in a small sample of sheltered minutes, that he’s a capable puck mover both with his feet and his stick. 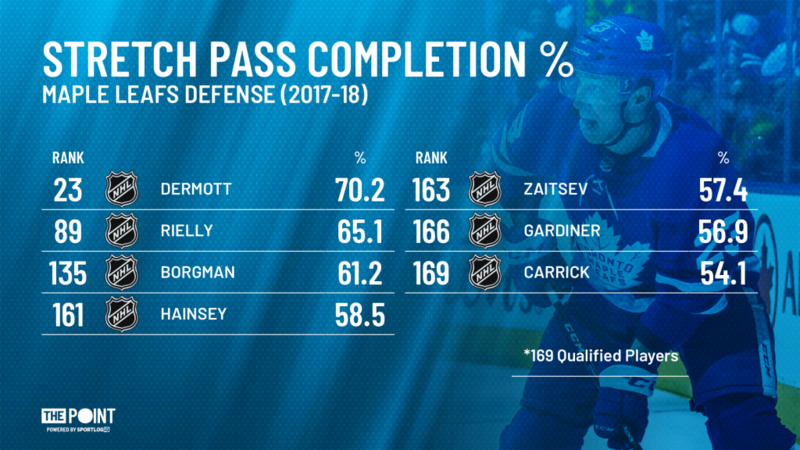 In addition to his high pass completion rate, Dermott set a season-high among Leafs defensemen last season skating the puck out of the D-zone 8 times in one game. Yes, he’s a left shot and Gardiner and Rielly are ahead of him on the depth chart but maybe it’s time to put him on his weak side and get him top-4 minutes. I propose the stance taken on stretch passes should be similar to the one baseball has adopted with its power over average approach to hitting. So long as you keep those homerun totals high, it doesn’t matter if you strike out a ton. The data supports both theories. The Maple Leafs volume approach, stretching passes into the neutral zone, is the right one for them and should be employed by any team that is speed heavy at the forward position. Dermott appears to be their best option to improve in an area they rely on significantly. We’ll see what kind of opportunities he gets when the puck drops October 3rd.